With just two episodes left, Gotham is about to go out with an almighty bang featuring the biggest Batman villain of all time. On Monday afternoon, Fox released the teaser trailer for the final two episodes and despite showrunner John Stephens denying Cameron Monaghan’s Jeremiah and/or Jerome Valeska would be The Joker, this first look all but confirms it. Monaghan can be seen in the promo shot sporting The Joker’s iconic purple jacket and despite being mostly bald, he still has some stringy hair that appears to have a green tint to it. 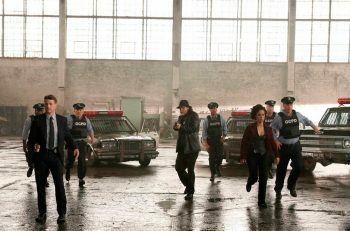 It has been confirmed that the final episode of the show is set 10 years into the future. The very beginning of the trailer seems to point to this as Wayne Tower is seen high atop the city. Gotham‘s take on The Joker, or “J” as he’ll be known, seems to be the scariest of them all. Yes, I’m saying Monaghan’s Joker has the potential to be even better than Heath Ledger’s from Dark Knight. We have to wait just a little longer to find out for sure though. What do you make of the The Joker’s look? Let me know in the comments below! 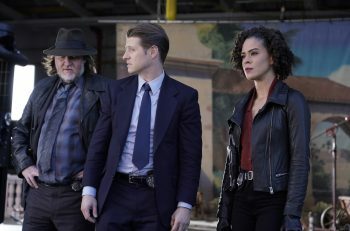 Gotham returns to Fox on April 15 at 8/7c for part one of its two-part series finale.